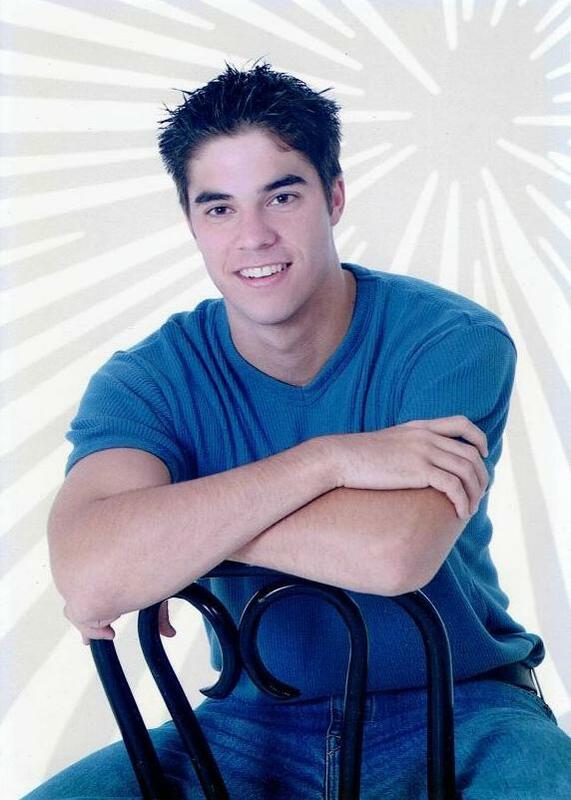 Flashback to the early 2000’s! These talented twins were lifeguards at the pool and worked in fitness here while they were in high school and college. You might wonder, where are they now? Cory anchors News 4 This Morning every weekday from 4-7 a.m. with Marissa Hollowed. As a St. Louis native, Cory cares about the people & places in our local communities and feels blessed to be able to share the stories that impact our communities every day. 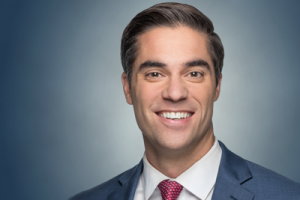 Cory joined KMOV in 2013, since then he has uncovered and reported numerous stories that have led to positive change in St. Louis. In 2016, his series of reports targeting safety concerns at a downtown parking garage led to surveillance cameras being installed and the business implementing tighter security. Cory is passionate about watching out for the little guy. He’s equally as passionate about volunteering and getting involved with non-profit organizations in the St. Louis area. From helping to build houses with Habitat for Humanity St. Louis, to helping with the fundraising efforts for organizations like Annie’s Hope, Neighborhood Houses and St. Louis Crisis Nursery, Cory gives hours of his time to support the important work happening in St. Louis. Cory graduated from Marquette High School in Chesterfield. He’s a proud Butler University alum and a huge Bulldog Basketball fan! Cory loves spending time with his wife, Sarah, and son, Carson, and one on the way! Kyle is the Director of Content & Technology/Partner at the Chicago office of OrgStory. Spending his career working with some of the largest brands in the world, Kyle brings his strategic focus to helping nonprofits communicate the right stories to their constituents. 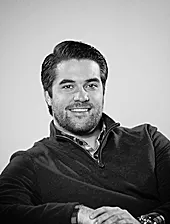 Prior to joining OrgStory, Kyle worked at Groupon (GRPN) where he supported and developed Groupon Grassroots, a digital fundraising platform for nonprofit organizations in Midwest markets. In addition, he has volunteered with several nonprofit organizations at various capacities. Over the last seven years, his creativity & contagious energy has helped elevate organizations to their fullest potential. At OrgStory, Kyle manages all client partner projects, internal marketing initiatives & assists with research and strategy for nonprofit organizations across the United States. 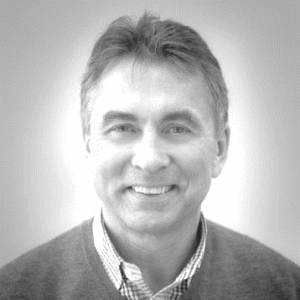 He is a frequent speaker on marketing & communications at college forums and often writes on marketing strategy. Kyle is also an active board member & organization advisor. Kyle holds a B.S. in Marketing from Miami University’s Farmer School of Business. He resides in Chicago with his wife and their 2 boys, ages 3 years and 9 months. This month’s member spotlight, Annette Keller, shared with us her life-changing experience from 2000. She went to Michigan to care for her grandpa who was having cataract surgery. After surgery he had some heart issues so she took him to the doctor where they discovered he had bad diabetes. After the doctor finished caring for her grandpa, the doctor turned to Annette, inquiring as to her relationship to his patient. 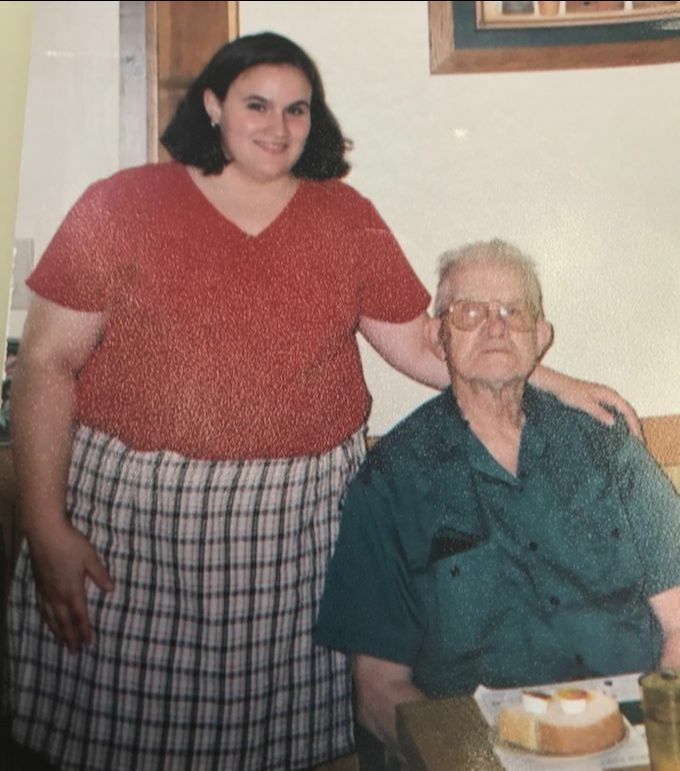 Upon learning she was related, he exclaimed loudly “Oh my God you, you are so fat.” This was the first time she had met this doctor. Shouting, he interrogated her about her education and what she did for a living. Shocked, she replied by telling him about her St. Louis University double major in Human Resources and Marketing and the successful career as an HR professional at a pharmaceutical company. The doctor continued to berate her saying how she should know better, how obese she was and didn’t she know she was killing herself. His belittling was so loud in fact, that others in the office came to see what was wrong and patients in the lobby also heard his ranting insults. She was devastated and had to walk out of the office in front of everyone. Even worse, after thinking about it she realized his concerns for her health were correct even though his behavior was inexcusable. Annette left that day though determined to never experience something like that again, and was determined to make a change. And that she did. At 300 lbs. she was getting shin splints just trying to walk into work, so a Richard Simmons’ stretching video at home is where she began. She consulted with her brother, who is a protein biochemist, and he helped her put together a well-balanced diet plan. She also drank, & continues to drink, a lot of water – around a gallon per day! Once she was able to walk a bit easier, she added Campbell’s soup can curls & leg lifts until progressing to using a recumbent bike. With her dedication and commitment, she had lost 98 lbs. by the following summer! She recalls waking up one morning with an energy running through her like nothing she had felt before. She could not believe how much better she was feeling and what a significant improvement this change was making on her health. She persisted and a year and a half later, she had lost 150 lbs. In Annette’s words, “At 300 lbs., it was like I was invisible to the world – no one sees you. The most surprising thing is how differently people ‘see’ you and recognize your value when you are physically fit.” She continued exercising regularly until severely tearing the labrum of her hip in 2013. Complications from surgery made it difficult even to do her grocery shopping without using a wheelchair. Doctors told her she would likely never be able to run again. While this setback could have sent her into a downward spiral, Annette took on the challenge and fought back. She persisted, finding other ways to exercise such as using the pool. She also saw Dr. Mike Murphy, Doctor of Chiropractic with a specialty background in sports injuries and active release therapy, who helped her get back on her feet and begin her road to recovery. Ready to progress to the next level in her rehab, in 2015 Dr. Murphy referred her to the CAC’s personal trainers, Jason Rulo and Keri Morgan, who have been instrumental in helping her regain her strength and return to her physical fitness activities. Since that time, they have rehabbed her through several surgeries, including shoulder surgery, adapting her exercise routines to incorporate her therapy exercise, and keeping her exercising during the recovery periods. She has progressed to training with them three times a week and is no longer held back by her physical condition or injuries. Not only has she returned to a healthy, active lifestyle, she is excited to be participating in her first 5K since her hip injury, the Wine Wobble, in April. And we cannot wait! 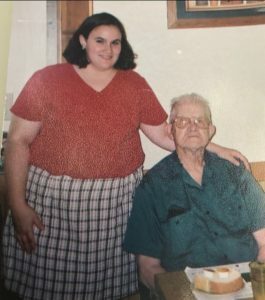 The ‘before’ picture of Annette was taken with her Grandpa on the day of the encounter with the doctor. Her ‘after’ picture was taken recently with her husband of nearly 13 years, Brad Keller. If you’ve been here on one of our vendor Fridays when sweet Ann Edwards was selling ‘Harry’s Honey’ you know it’s the Best. Honey. Ever. There’s so much more to this lovely lady, a retired hair stylist for 53 years, who will be celebrating her 85th birthday in March in excellent health. She says it is all thanks to her regular exercising at the CAC which she’s been doing since the Castle Oaks days in the 70s. The matriarch of the family, Ann, and her husband, Harry Jr., enjoyed the club with their 3 children, Bill, Harry III, and Teresa. A competitive figure skater, Teresa is pictured here on the club’s old skating rink where the indoor pool is today. Bill now lives in Texas but Harry & Teresa are both in Chesterfield and members of the club with their children. Harry III took an interest in honey when he was younger and eventually started his own hives over 10 years ago. 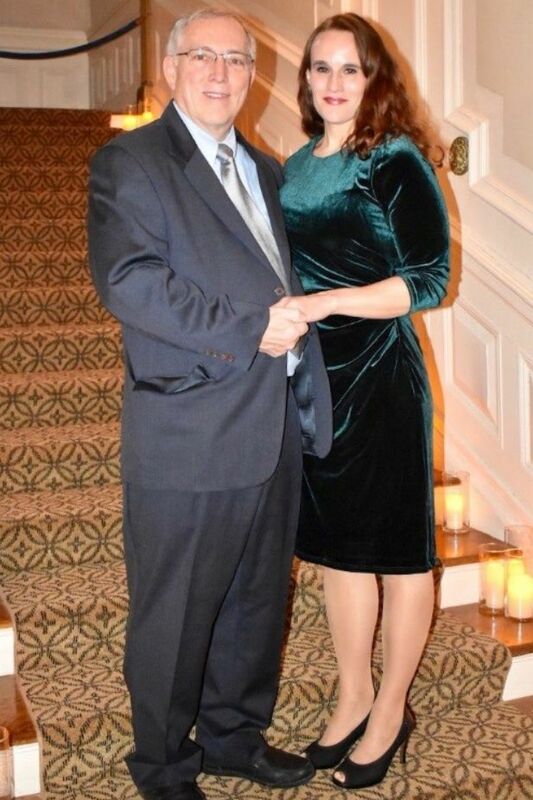 He married his high school ‘honey’, Cindy, and together they started their own business, Tri County Landscape Services in Chesterfield which provides landscape services of all kinds from retaining walls, driveways/pavers, mulching and lawn maintenance to snow removal. 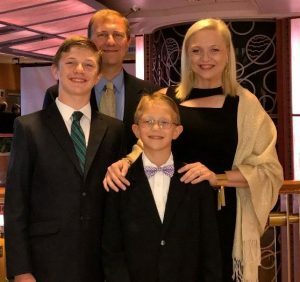 Their oldest son, Matt (36) lives in Lake St. Louis and is a compliance risk manager for Citibank, their younger son, Harry IV (17) is a junior at Barat, and daughter, Alyson (26), assists with the family business. Teresa met her husband, Marvin Clark, in Dallas playing sand volleyball & they returned to her home town of Chesterfield in 2006. Teresa, featured in this month’s business spotlight, is VP of HR for Missouri Botanical Gardens and Marvin is a Financial Analyst at RGA. Ella, their oldest daughter is studying Neuroscience and playing softball for Macalester College in St. Paul Minnesota. Their younger daughter, Katie, a senior at Duchesne High School, plays softball for St. Louis Chaos where her team placed 2nd in the Junior Olympic Cup in 2018! You may also recognize Katie from lifeguarding at the pool during the summers. Their son, Spencer, is a senior at Duchesne high school and enjoys mountain biking & cross country and has participated in Pedal for the Cause the last 2 years. What makes the CAC so special is that it is full of families like this, and we are so happy to have them as part of our CAC family! CAC Member, Erin Slutzky, a Junior at Parkway West High School, had a pretty exciting year in 2018. 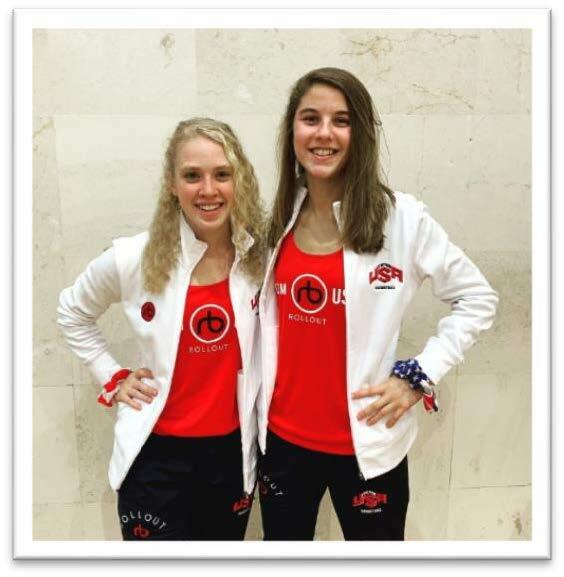 After winning runner-up in June at the National Junior Olympic Racquetball Championship in Des Moines, she qualified to play for Team USA in the Junior World Championships in Mexico which she competed in last fall. Pictured here with her doubles partner, Annie Roberts, from Oregon, and below with Team USA. 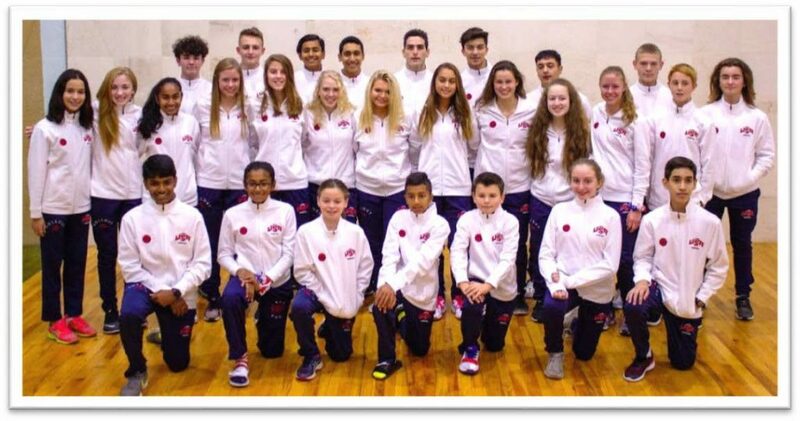 Erin won two out of four games in both singles and doubles; the USA girls’ team placed second out of 14 countries, with the USA team taking third overall when the boys’ results were added. In her free time, which is very limited, Erin enjoys watching Netflix, reading and hanging out with friends. Soon, over spring break, she will be looking at colleges and is leaning towards staying in the Midwest. She doesn’t want to base her decision solely on playing racquetball because it would limit her options, but she definitely would like to continue playing and compete in as many world championships as she can which would be through her sophomore year of college. Way to go, Erin! 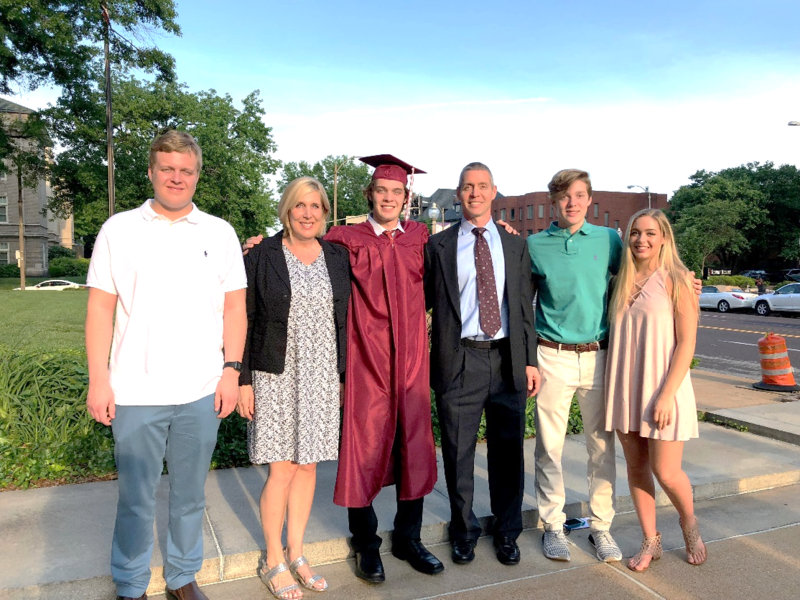 CAC member, Michael Haddad, grew up in Ballwin and after graduating from Marquette High School, he went on to receive his degree in international business from Missouri State University. At that time, Michael had no intention of entering the family business, The Diamond Family, featured as this month’s business spotlight founded by his father in 1978. 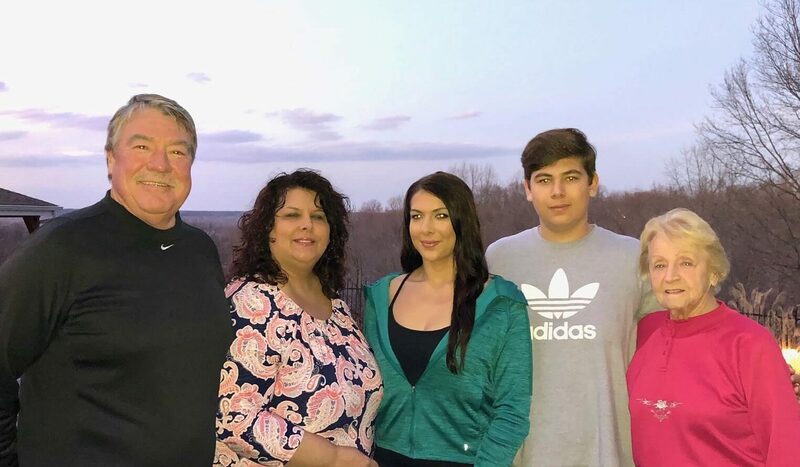 Instead, Michael wanted to travel, and he spent some time in Egypt where his parents were both born (his father, Rocky, is from generations of jewelers and Nahed, his mother, was a special education teacher in Rockwood.) It was at the end of 2007 when Michael’s father asked for his help, and so he returned. Michael has an incredible ability to make friends & co-workers feel like family, and he wanted to make sure their store made people feel the same. 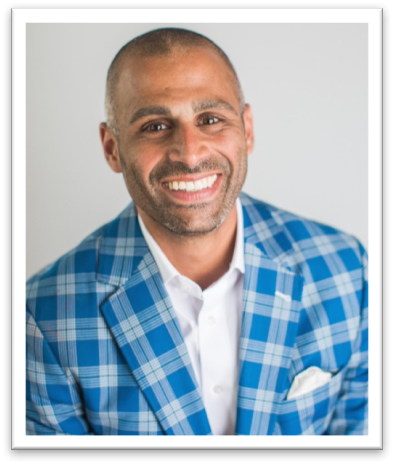 He continued his education by earning Gemological Institute of America certifications and helped the business join the Independent Jewelers Organization (IJO) where he now sits on the millennial board. As the president of the family business, Michael is in charge of sourcing stones and sales training, and he helps with marketing. His brother, Alex, is the vice president and designer who manages & trains their staff. Most of their marketing is handled by his youngest brother, Anthony, who owns Yummy Image Media, a digital marketing firm. The holidays keep Michael very busy at the store, and when he is not working there or workout out at the club, he enjoys spending time with family and friends. 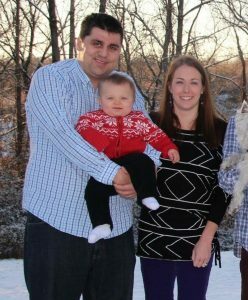 Michael lives in Creve Coeur with his girlfriend Erica, their 2 year old daughter, Lively, and dog Hardie. The Rigman family has been a part of the CAC family since 1993 (pictured: Tyler, Jacque, Jim & Tori.) Tori & Tyler enjoyed being on the swim team during their younger years, and Tori worked as a lifeguard during high school. In their own words, Jacque & Tori express that they “love all the fitness classes at the club, and the instructors are great! The classes are challenging but they also provide an alternative exercise for you if you need it.” Both Jacque & Tori have been taking 3-5 fitness classes weekly, but due to a recent stress fracture, Jacque has to take it easy for a while to recover. But she has a few other things going to keep her busy… helping Tori plan her wedding! 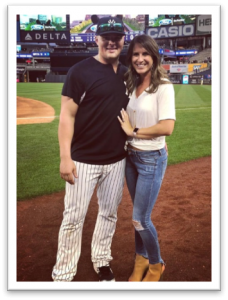 If you follow baseball, you may have heard of Tori’s fiancé, Luke Voit, who played for the STL Cardinals before being traded this summer to the New York Yankees. Luke and Tori have known each other since middle school but went away to separate colleges and reconnected by mutual friends after graduation. They hit it off right away and have been together for almost four years. 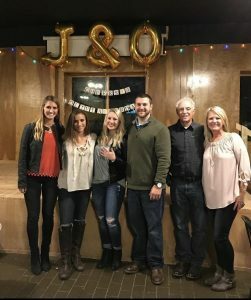 A perfectly romantic proposal caught her completely off guard when Luke proposed last year at Montelle Winery with some of their best friends in town. 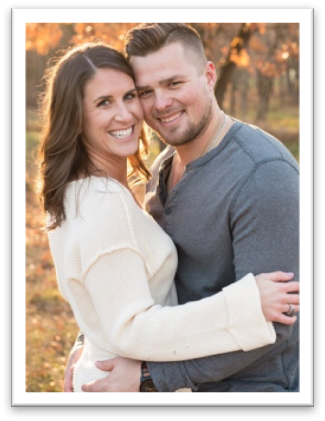 They are getting married December 15th and cannot wait! St. Louis will always be their home, but eventually they will live in New York. Luke has been enjoying playing for the Yankees, and they have both fallen in love with the city and all it has to offer. During all the baseball craziness, Tori is in her fifth year teaching 5th grade in the Parkway School District and loves it – each day is a new adventure! For now, Tori & Luke are having fun during the offseason entertaining friends & grilling out, but also trying to get some rest and relaxation in before the big day. 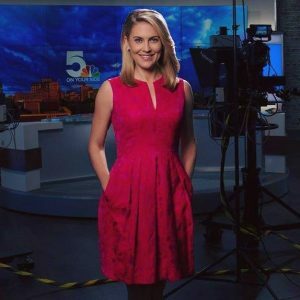 Not only is this month’s member spotlight a familiar face at the CAC, Anne Allred is also Anchor of KSDK evening news. It was just a couple years ago that Anne was busy balancing life as a successful career woman while preparing to have a baby. Then everything changed when she faced an emergency C-section and the premature birth of her daughter, Nora, born 3 months early and weighing only 1 pound 15 ounces. While Nora was at the NICU of St. Louis Children’s Hospital for an extended stay, Anne learned she was suffering severe renal failure due to a rare blood disease triggered by her pregnancy. Anne was initially unaware her kidneys were failing and when they realized the problem she had to start emergency dialysis immediately and an eventual kidney transplant. “When you’re faced with those kind of things, you don’t have any choice but to keep going,” Allred said. “That’s what I told myself. I had my daughter to keep going for.” Early into her prognosis, Anne was tested and placed on the list for a kidney transplant at Barnes-Jewish Hospital, one of four hospitals in the region that perform organ transplants. She found out she was on the list with 1,000 other people waiting for a kidney at that hospital alone. A long-time friend stepped forward, and after months of testing to find out if the organs would match, she finally had the surgery and was given her life back. Something else changed in her then too – her desire to help others in need of life-saving organs. Anne became an advocate for organ donation and hopes to raise awareness through sharing her own story and highlighting the stories of others. 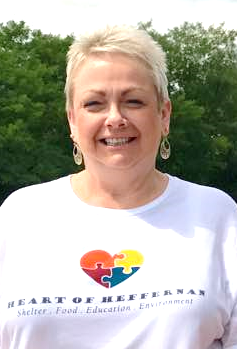 Anne emphasizes that we are in dire need of organs with over 100,000 people in need, and recommends that those interested in organ donation and want to learn more should visit https://www.midamericatransplant.org/, Mid-America Transplant, featured as this month’s business spotlight for more details. Please join the Mid-America Transplant 5K Walk on October 14, 2018. A native St. Louisan, Anne joined 5 On Your Side in January 2013. 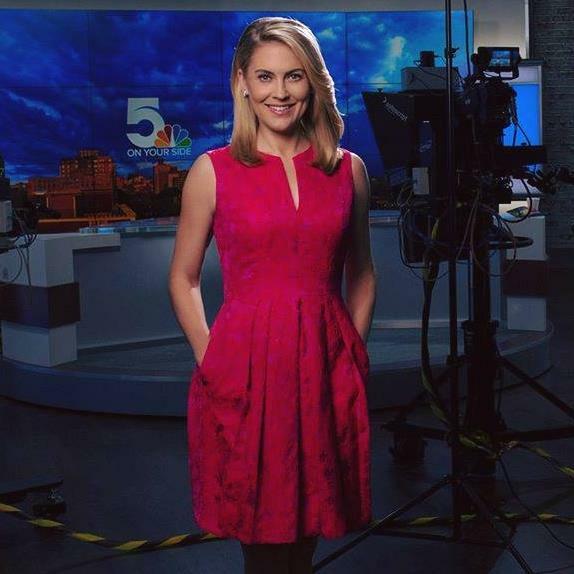 She anchors the 6 p.m. and 10 p.m. newscasts. She’s traveled extensively to cover some of the biggest new stories including content for the Olympics Games in Beijing, Vancouver, and London. Prior to that she was with WHDH, the NBC affiliate in Boston, where she worked for six years and served as the weekday morning and noon anchor which resulted in a 2012 Emmy nomination for best news anchor. She also won the Mid-America Emmy award for best news anchor for her coverage of the 2014 unrest in Ferguson, Missouri. It was love at first dive. 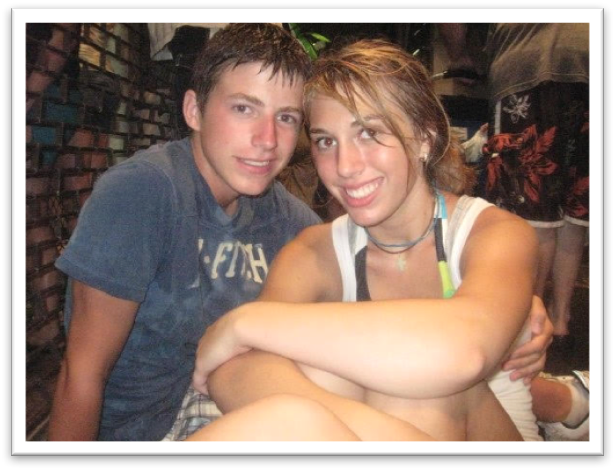 Joey Heitz and Cara Amundson met on the CAC swim team in 2008 when Joey was 15 and Cara 13. At that time, they were attending different schools and didn’t even know each other prior to the summer of swim team. Fall came and they continued to date all through high school. Then Joey, being two years older, graduated and went away to college at Mizzou. Their love prevailed, and when Cara graduated, she went away to Mizzou to join Joey. Joey graduated from Mizzou and moved to Philadelphia while Cara was still in college. After a year apart and missing each other like crazy, Joey moved back to St. Louis and Cara returned home after she graduated from Mizzou. Now the newly-weds reside in Clayton, Missouri, where they have made their home. Joey worksfor Brenntag Solutions as a food additives sales rep, and Cara just began her career as an occupational therapist for the Special School District in Hazelwood school district. 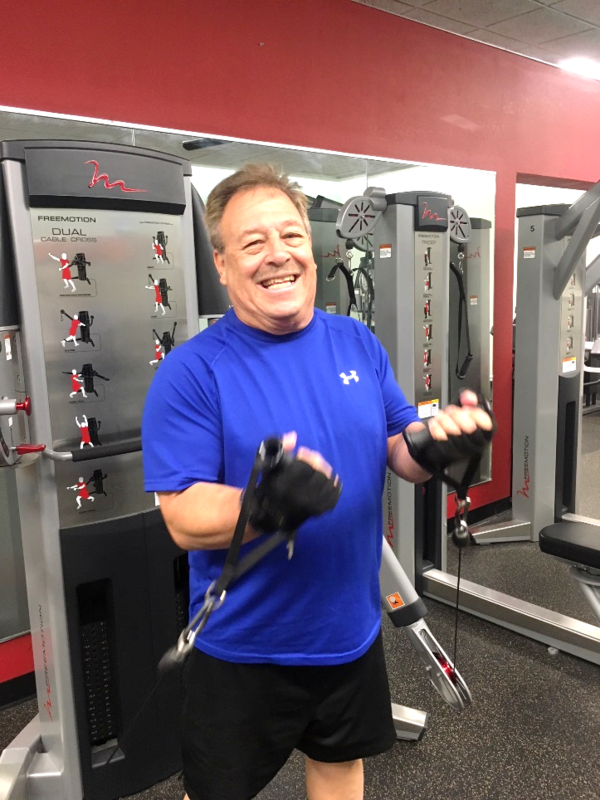 You might have seen this month’s member spotlight, Larry Winner, working out in the weight room or taking one of Denny or Jerry’s fitness classes. Larry’s smile and sense of humor are one-of-a-kind, and his friendly demeanor is welcoming to all. This St. Louis native was part of the last graduating class of Parkway High School before its name was changed to Parkway Central High School. At that time, he was living life to the fullest, taking classes at University of Missouri St. Louis and didn’t have a care in the world. Then, in 1969, everything changed – it was the Vietnam War. At 25 years old, he received his draft notice and became part of the Naval Reserves where he spent the next 6 years and received extensive training attending Radar “A” School and NTDS/ATDS (Naval & Air tactical data systems). He went on to what is known as Elint (Electronic Intelligence) which included training on electronic warfare, countermeasure, search measures and counter-counter measures followed by anti-air warfare & anti-sub warfare. He was able to put these skills to use when fully assigned to the USS Gridley (DLG 21) working in CIC (Combat Information Center) where they gathered data along with supporting operations into North Vietnam with the US Marines forward post on Monkey Mountain. They conducted those operations off Vinh, Hon Lai, and Cambodia. The rest he cannot talk about. When returning home, for many it was not a warm welcome but rather rejection they faced from the public who did not support the Vietnam War. For these veterans though, it was not a choice they got to make. Years later the memories still haunt him, but he has learned how to stay healthy both mentally and physically. Since he joined the CAC 8 years ago, Larry has lost 54 lbs. which he attributes to both exercise and maintaining a better diet (thanks, Denny). His workouts at the CAC with his friends and family are motivating for him and he enjoys the comradery he has with the fellow members. Now, after having his own business for many years, he is semi-retired and works part-time driving new cars to dealers. His son, Ryan, resides with him. When not at the club working out, he likes to go to the Muny, Fox and Stages. Next time you see Larry at the club, give him a high five and say hello! If you see this month’s member spotlight, David Bass, working out in the weight room, you might think, ‘wow, this guy should be playing professional football!’ And you’d be right, because this 6’4” 267 lb. 27 year old is the linebacker for the New York Jets. This weekend, however, he’s playing on a different field, providing a free youth football camp for kids ages 7-15. Camp participants will spend the day training with NFL players in addition to learning the value of dedication, hard work and perseverance. David is proud to be a St. Louis native and wants to bring a positive light to his hometown while helping kids fulfill their dreams in the process. A standout football player & captain of his team at University City High School, David became an all-metro selection and was awarded the Fab-25 Demetrius Johnson Award, given to the top defensive linemen in Missouri and Illinois. His high school success earned him a football Scholarship to Missouri Western State University where had an illustrious career, breaking the school record with 40.5 career sacks and 50 consecutive starts. In his senior year, Bass was a finalist for the Gene Upshaw Award and played in the East-West Shrine Game. Drafted by the Oakland Raiders in 2013, David has also played for the Bears, Titans and Seahawks and the New York Jets just re-signed David for another year. 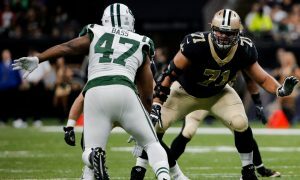 He is tied for second on the team with 3½ sacks, and also had 33 tackles, 12 quarterback hits and seven tackles for losses. He’ll provide depth on New York’s defense and help the team’s pass rush. David has nine career sacks and two interceptions, including one returned for a touchdown, in 64 NFL games. Rich, Kim, Luke, Will, Maddy and Joey Oliver have been members of the CAC since 2015. 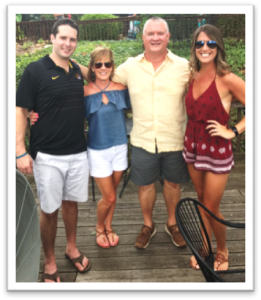 When they joined, Kim & oldest son, Luke, began working out regularly with Jerry Morrison, CAC personal trainer, to improve their strength & endurance. The other Olivers were soon actively involved at the club as well. 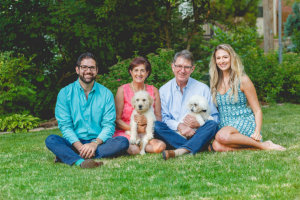 Raised on the Hill in St. Louis, Rich moved to Chesterfield in 1995 and has worked for 25 years at Kennedy Capital Management in Creve Coeur. He enjoys working out on the weight machines & in the cardio room, and he especially loves being able to spend time with his kids by going along with them to the club. 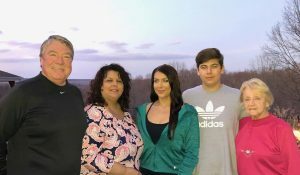 Kim, a former teacher in the Rockwood School District & preschool teacher at King of Kings Lutheran Church in Chesterfield, now enjoys being a stay-at-home mom. Her kids have inspired her to begin working out and she, too, works out with trainer, Jerry Morrison. 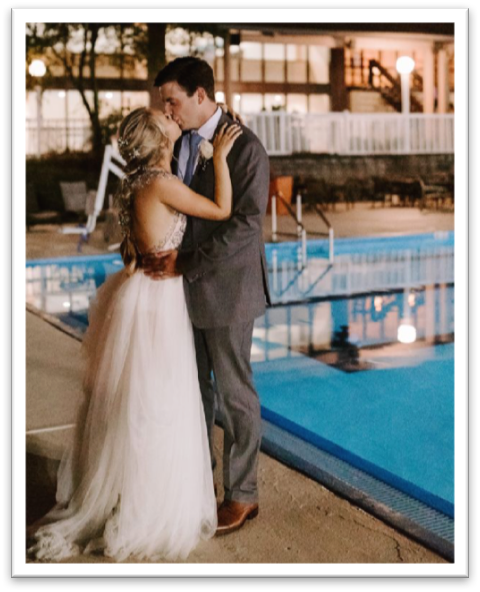 Luke is a junior Cybersecurity major at Maryville University and also a very talented violist – he recently played for tennis pro Donna Austin’s wedding. A regular client of Jerry’s, he keeps a challenging strength training & cardio workout routine and you might often see him swimming laps in the pool. 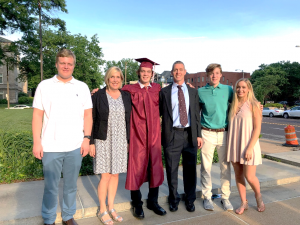 A recent De Smet Jesuit High School graduate, Will has been actively involved in many St. Louis hockey organizations including De Smet hockey, AAA blues hockey and Affton St. Louis AIC Prospects. He is looking forward to playing junior hockey this fall and works out at the CAC to enhance his strength and stamina on the ice. Maddy will be a junior at Parkway Central High School where she is actively involved in the school’s Dance Team, student council and National Honor Society. Most of her free time she spends with the Renee Johnson Dance Floor competition dance team, and she works out with Jerry to build the strength she needs for dance such as stabilizing for long periods of time on one foot, strengthening her muscles for high leaps in addition to keeping her flexibility. The youngest Oliver, Joey, will be in the 8th grade at Parkway Central Middle School, and he is active in Chesterfield Hockey. 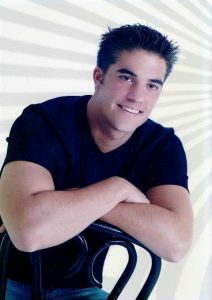 In his free time, Joey enjoys playing basketball and swimming at the club. Now working on his second retirement, Greg decided to get certified as a USPTA Tennis Professional. To get this certification, he had to take online courses, a written test and a full day of on-court testing that included demonstrating a wide variety of tennis skills, feeding balls for different situations, giving a group lesson and giving a private lesson. He prepared by helping with various clinics at CAC and a lot of on court practice. Greg says, “It allows me to give back to the sport that has been very good to me and to learn new things.” Greg is active in interclub and USTA leagues, as well Senior USTA tournaments. He is also a board member at Dwight Davis Memorial Tennis Center. In his previous life, Greg spent 40 years in the aerospace business with Boeing (McDonnell Douglas) and Astronautics Corporation of America. After eight moves and two retirements, he is back at CAC. The Burtons first joined CAC 1999; Sharon joined ladies interclub and played on one of the many ladies teams at the time. Children, Lexa and Greer, participated in clinics and lessons with Paul, Tracy, Jack, Winn and Craig, then eventually became helpers in the kids clinics. Lexa and Greer went on to college in California. Now, Lexa lives in Brooklyn where she teaches and develops chess and music classes for preschoolers. Greer owns a sustainable farm in upstate New York. Sharon is a serial rehabber and fixing up a 175 year old second home near Greer, along with a place in Wildwood. If you see Greg at the club, give him a high five! Celebrating 49 years this year! 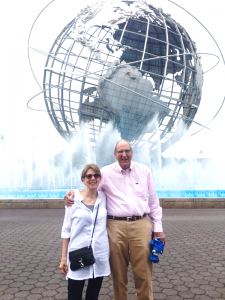 You may have met members Jim and Grace Long in a Yoga or foam-rolling class or playing pickle ball in the gym where they’re regulars and they’ve become pretty good at it! But they’ve been coming to the club much longer than pickle ball has been around here. 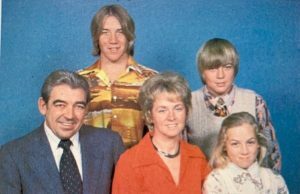 When they joined in 1983, Grace was mostly in the pool swimming laps and Jim exercising in the weight room or on the tennis courts. The happy couple met at the University of Illinois; Jim was getting his PhD in Electrical Engineering and Grace was one of only 5 women in her graduating class of the College of Veterinary Medicine. Grace also holds a Master’s degree in Clinical Pathology and later went on to receive her MBA from Webster. She recently retired from Purina, but still works part time at Heritage Veterinary Hospital (see business spotlight below.) She is from Bloomington, Illinois, and Jim from Oakley Kansas, but McDonnell Douglas was what brought them to St. Louis which is where they call home. Jim is now retired from FlightSafety International after spending many years developing their flight simulators. This summer will mark their 49th wedding anniversary and they have 3 grown married children and 4 grandchildren to help them celebrate. Other than her favorite hobby of playing pickle ball, in her free time, Grace also enjoys watercolor painting and playing the piano at Incarnate Word. And Jim is studying up on his pickle ball skills on YouTube! Come join them for one of our open pickle ball days and say hello! When Diane is not working at Heffernan Insurance Brokers, you will typically find her volunteering or participating in events for their non-profit clients. Volunteering offers vital help to people in need, worthwhile causes and the community. Diane has found that volunteering and helping others can help reduce stress, combat depression and keep her mentally stimulated. She also found a sense of purpose from a most humbling weekend in Houston helping out after the floods. Diane spends a lot of time working with Operation Food Search who feeds over 200,000 people in the St. Louis area each month, one-third of which are children and volunteers with the Pujols Family Foundation whose mission is to promote awareness, provide hope and meet tangible needs for children and families who live with Down syndrome. 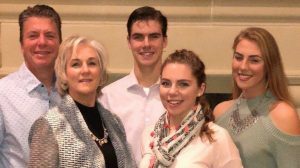 Next up for Diane is the Lung Cancer Connection’s annual “RUN.WALK.BREATHE” and the “Walk To End Lupus Now – Saint Louis” which you can learn more about below. The Hasson family have been CAC members since 2015, and over the past year we’ve been seeing a lot less of Owen…145 pounds less that is! 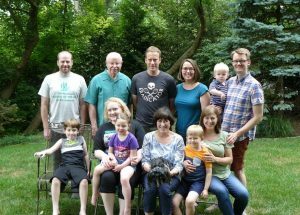 All of Owen’s numbers were high – blood pressure, cholesterol, blood sugar, and diabetes runs in his family. It was no surprise to him when the doctor advised him he had to make some changes. He started by attending a healthy lifestyle class, purchased a Garmin fitness tracker and downloaded the ‘My Fitness Pal’ app. While using portion control and watching his carbs, Owen began exercising by walking around the block, which exhausted him at first but that didn’t stop him. Emily suggested they get back into playing tennis which they hadn’t done since high school, and once they started playing again they wondered why they hadn’t done it sooner! Owen could also see the positive impact exercising had on Emily and how much she enjoyed the club. So he began taking a few fitness classes such as Benita’s Trekking and Kristina’s Tabata, and found how motivating they are. 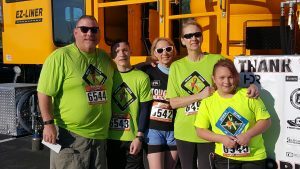 He kept walking, and together the family completed their first 5k together in April 2016 (see pic). Although he finished close to the end, he didn’t give up. After that time, Owen gradually increased his speed and distance, and on August 26, he ran his first half marathon! 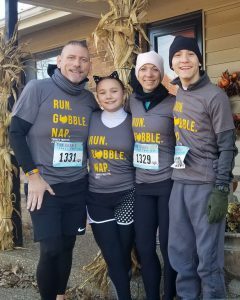 It’s since become a family affair – they’ve completed two 5Ks together with their children, Max (15) and Samantha (11). Owen’s numbers are now in line, he’s off all the meds and no longer has sleep apnea. 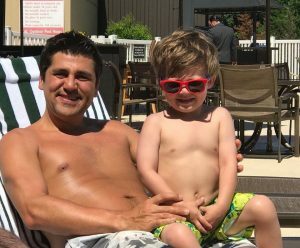 His energy level has increased and he says he feels better than ever, with one exception – he was diagnosed with Parsonage Turner Syndrome, a rare peripheral nerve disorder causing pain and weakness in his shoulder. While this has been temporarily preventing him from playing tennis, he has kept his spirits up and staying active on the fitness side of the club. His advice is: “To begin, begin.” And above all else, never give up. As for the rest of the family, Emily has completed 2 half marathons and a Tough Mudder, and she enjoys taking the fitness classes & playing tennis at the Club. Max plays tennis and Samantha is looking forward to her 3rd year swimming on the CAC swim team. If you see them at the club, give them a high five! We love it when members come back! Arina Lanis and her family were CAC members but had to leave in 2009 when her family relocated to Kansas City. A graphic designer, photographer & marketing strategist, Arina spent her first seven years in Kiev, Ukraine, before moving to the US with her parents. Since she’s been in St. Louis, she’s implemented branding & marketing campaigns for some of the area’s most prominent businesses and even published her own magazine. In KC, she was a regular on TV’s, Better Kansas City, where she inspired viewers with tips & ideas on entertaining & party recipes. Now, she’s writing a book about entertaining, real parties for real people; stay tuned for more details! When you hear John Ulett’s voice at the Club, you may think there’s a Cardinal game on the radio. That’s because John “U-Man” is one of the most recognized voices in St. Louis – he’s been broadcasting at KSHE Radio for 41 years, 33 of which as the Public Address Announcer for the St. Louis Cardinals! Ruth adds that working out, relaxing at the poolside cabanas and playing pickleball are some of the family’s favorite things to do at the Club. 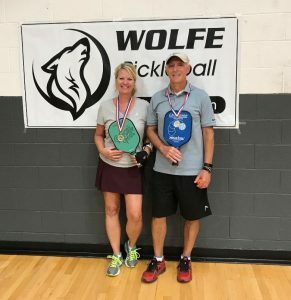 And John & Ruth have picked right up on pickleball – taking Silver in a Mixed Doubles Pickleball Tournament in October! When you see them at the club, give them a shout out or a high five! They plan on playing more pickleball in the future and have been enjoying the new outdoor pickleball court, too – they have definitely caught the pickleball fever! After getting his biometric screening in May 2016 for his company’s health insurance, Dave reviewed his results with his doctor who expressed grave concern. His numbers were terrible, and at the time, he really didn’t work out. His diet was horrible and he was eating all the wrong foods – it was no wonder he had such a low energy level. Dave knew he had to make some significant changes. The thought of not living to see his 3 year old son grow up and missing time spent together with his wife was too much to bear. At 285 pounds, Dave had to both improve his eating habits and start a fitness routine. With the support of his family, he drastically changed his diet to include smaller portions with more proteins such as chicken, fish and yogurt. He started walking on the treadmill to get in shape, and little by little, he progressed to jogging and then on to running. As his endurance gradually increased, so did his confidence. To continue challenging himself, he started running long distances outside. With his energy level improving, he was able to work out longer and run further while gaining muscle mass in the process. The pounds started to shed, and fast forward to today, he’s lost 90 pounds and feeling better at 195 pounds than he has in years. So much so, he decided to run his first half marathon on October 1! Dave shared his before and after pics to encourage others that it’s never too late to start. If you need help, just ask one of the CAC trainers or fitness instructors to point you in the right direction. They truly care about the members’ health & well-being and will go the extra mile to get you there. This month marks the 20 year anniversary the Carters have been members of the CAC. David and Sandy joined originally to play tennis then found they enjoyed the fitness side of the club equally as well. David, a financial analyst, plays on Paul’s men’s Saturday Doubles, enjoys working out and taking fitness classes. Sandy plays on Paul’s Ladies Interclub team and participates in a fitness class almost daily. Originally from Milwaukee, they had no family here when they moved; but since they’ve been at the club, they have made so many close friendships with fellow members they now consider them as their extended family. One thing is for sure, there’s no shortage of laughter and fun when the Carters are around! They recall some of their fondest memories at the Club’s social events – from the St. Patty’s Day Tennis Mixer to the “HalloWine” Party. They are some of the club’s biggest fans and they’re looking forward to this year’s wine tasting event on October 13 – this time with a 70’s theme – and we can’t wait to see what they have in store for us then! An active tennis and racquetball player, CAC Member, Bruce McKay, has been working out and playing court sports at the club since 2013. Maintaining a fit & healthy lifestyle has always been a priority for him, and he enjoys the camaraderie he has made with fellow club members. 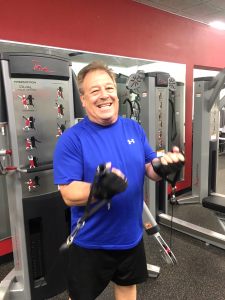 He had been doing everything right – exercising & eating well – but following a routine physical last October, Bruce’s doctor found his PSA levels had risen from less than 1 to over 5 in less than a year. The diagnosis: Stage 1 prostate cancer. After seeing a Urologist, Bruce underwent a biopsy which found two small areas of cancer on his prostate. His options were “watchful waiting” as these cancers are slow developing; or have it removed. Radiation was not recommended as he was considered too young (at 62) and it presents other collateral risks later in life. 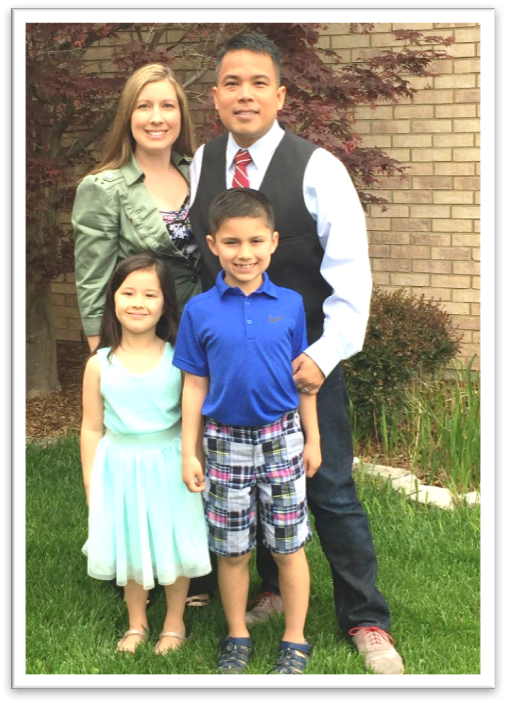 Bruce opted for surgery which was completed laparoscopically in June at Mercy Hospital. Because the procedure was minimally invasive, he was up & walking two days later and resumed working two weeks later. And he was thrilled to be able to return to his normal fitness routine at the club in mid-July! He is convinced that his preparation & workout routine had a huge bearing on his rapid recovery. He did a lot of abdominal stretches & light-weight routines before the surgery which helped the muscles recover more quickly. That in turn minimized typical post-surgery complications such as incontinence. Share the experience with others. There is a lot to know about the different treatment options and some of it can be confusing. The more you ask, the more you learn. And his type of cancer is very treatable with a high survival rate (99%), when detected early. Diet and fitness make a difference. Our diets are a major contributing factor to various types of cancer. Find out what is right for you. An Executive Coach & Leadership Consultant, Bruce moved from Toronto to St. Louis in 2004 and became an American citizen in 2012. He is married with five children, all of whom are grown and living away – two in Florida, two in Canada and one in California, and he has three wonderful grandchildren, so he plans on doing a lot of travel in the future. 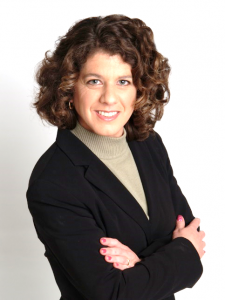 CAC member Debra Sartori grew up in Durban, South Africa, and moved to St. Louis in 1993 while working for an international software development company. After a career in software development, she decided to pursue her first love, real estate, and she is now one of the top real estate agents in the St. Louis area representing Keller Williams. When she is not working out at the Club or assisting clients, Debra is actively involved with the Leukemia & Lymphoma Team in Training raising money for cancer research. Most recently, Debra and her team completed a 100 mile bike ride around Lake Tahoe, America’s Most Beautiful Bike Ride, raising $104,000 and the naming rights for a research grant! The overall event raised over $3.25M which will help to find a cure for Leukemia, Lymphoma, Hodgkin’s disease and Myeloma, and improve the quality of life for patients and families. Debra’s passion towards this cause started about 7 years ago when she signed up to do both a half marathon & a triathlon (the same year no less!) One of her friends had passed away from Leukemia and had children the same age as hers; she couldn’t imagine how hard that must have been for them to lose their mother at such a young age. Debra has also been inspired by the survivors who participate in the events. She was excited that this was her third event with TNT which was recognized as the Triple Crown. For more information on Team in Training, contact: Rich Sloan at 314.578.6595, rich.sloan@lls.org. And, if you’re looking for an expert in real estate, contact Debra at 636-346-5367 or e-mail debra@DebraSartori.com. Sometimes our children are the reason we are drawn into new places. Just ask Chris & Kelly Tudtud, who relocated from the Northern Suburbs of Chicago into Chesterfield 18 months ago. They attended an expo on kids’ camps hoping to find a place for their children to enjoy over the summer since they both work full-time. Chris and Kelly chose the All Star Kids Camp at Chesterfield Athletic Club (CAC) for Seth, their 7 year old son, because it offered a variety of activities and sports for him to enjoy, and most importantly CAC offers a before & after child care that accommodated their work schedules. Seth spent several weeks of his summer vacation at the camp. He made new friends, he was exposed to many sports and group activities. Most notably Seth really enjoyed playing tennis – so much that he decided to continue in the fall after the camp was over. With Chris and Kelly spending more time at CAC for Seth’s tennis lessons, they saw other great programs for the entire family to enjoy – like swimming for Mercy (their 5 year old daughter). To experience all CAC had to offer, they became a platinum full club family and started working out with personal trainer, Jerry Morrison, who has been great at keeping them on point. An avid runner in the past, Kelly felt it was a good time to get back into it and found that Benita’s trekking classes have been just the inspiration she needed to regain her stamina. What Chris and Kelly say they love most about the club is the family atmosphere and how there is truly something for everyone and added, “We are so blessed with CAC’s Amazing Staff!” They also like CAC’s community outreach programs like the DASA (Disabled Athletic Sports Association) and the Rock Steady program which helps people with Parkinson’s. The Tudtud family is excited about spending their summer at CAC. CAC Member, Carla Grumke, thrives on staying busy and loves meeting new people while she balances a hectic schedule being a performer, artist, avid tennis player and mom. Over the last decade at the CAC, we’ve had the pleasure of getting to know Carla both on the courts and on the stage. Carla’s true passion is singing and she is the female vocalist of the Everyday People Band whom she’s been performing with for over five years playing at various CAC pool parties as well as summer concerts and private events. Everyday People is a 7-8 piece variety band with a brass section who can perform a wide selection of current pop hits as well as classic old time rock n’ roll favorites. For more details and to book an event with The Everyday People Band, visit their website at: https://everydaypeoplestl.com/. When she’s not performing or playing tennis, Carla works full time as a hair stylist at Tony Russo’s Hair Designs in Ellisville. She is always happy to meet new clients, and can be reached for appointments by text or calling 314-435-1873. 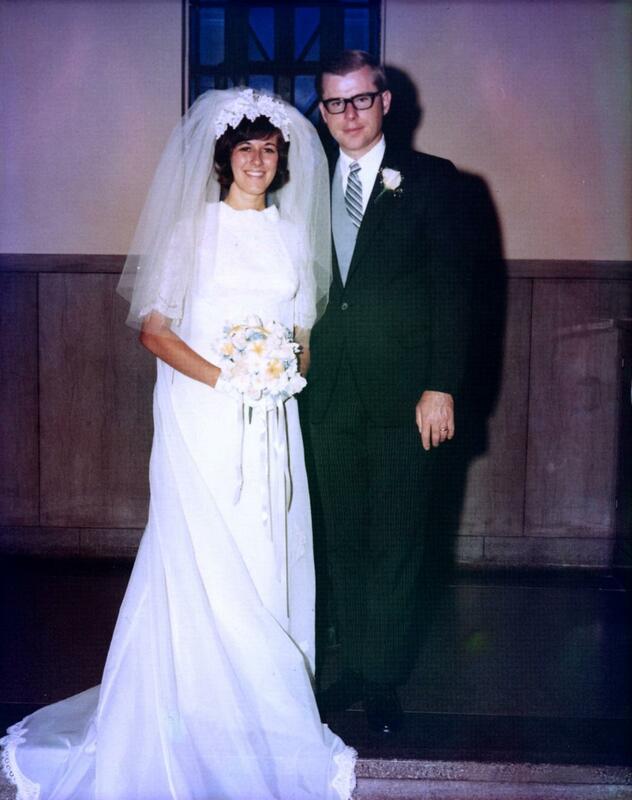 Working their way through college at Farrell’s Ice Cream Parlor in the 80s turned out to be much more rewarding than either of them imagined – it was a match made in heaven for Greg & Sue Finn. The two lovebirds moved to St. Louis in 1988 for Greg to attend Wash U Med School, and Sue was a clinical research nurse at WUMS. Greg was born to be a pediatrician, and kids always gravitated towards him. His vision was to build a practice that could accommodate a variety of patients & families with an emphasis on the best medical practices in a compassionate, kid-friendly environment to help patients be their healthiest. In 1997, after child #3 came along, Sue became a stay-at-home mom while Greg built his practice, Bluefish Pediatrics. Today, Bluefish Pediatrics consists of 4 doctors, two female MDs and two male MDs, all who have been chosen as “St Louis Best Doctors” and listed in St. Magazine for the past 10 years! In his free time, Greg enjoys woodworking, hiking, running, gardening, cycling and learning to play tennis at the Club. Sue enjoys the CAC fitness classes, reading, cycling, gardening, hiking, traveling and any kind of creative endeavor! And, they both love spending family time with their 3 children (+1 fiance’)! February’s Spotlight member is none other than Jim Baldanza, aka ‘CAC Racquetball Guru’. Jim has been playing racquetball since 1978 when he played his first game in a New Jersey Club where they were preparing for the worst snow storm in over a decade. With already 4 inches on the ground & more coming down, their plan was to play until they were tired, then ride out the storm in the bar next door. They were about an hour away from part B of the plan when they heard a knock on the door – “You guys ever played this game before?” asked a guy wearing a NY Yankee hat. With their mouths still wide open they managed a “no sir Mr. Berra”! Jim would like to credit Yogi for teaching him how to play the game, but that would be stretching it a bit since he never did play Yogi on the courts. Jim’s love of racquetball grew, and he’s been playing at the CAC since 1986. He enjoys teaching beginners about the sport and even offers a racquetball summer camp for kids. Jim’s also the ‘go to guy’ when it comes to coordinating round robins, mixed league play and welcoming new members. So if you’re looking to learn a new court sport, he’ll get you going in the right direction! Call Jim at 314.422.8804 or email jimdanza@gmail.com. January’s Member & Business Spotlight, Dr. Cynthia Fleck, has a long list of accolades, including being the reining Mrs. Missouri 2016 and 5th Runner-Up at Mrs. USA as well as Mrs. Chesterfield 2016. A Southeast Missouri State BS, Fontbonne University MBA, University of Texas, Houston Medical School and University of Monterrey PhD alumna, Cynthia is an advanced practice nurse & business owner of a medical/surgical/biotech/education/expert witness consulting firm and serves on the Board of Directors of the American College of Clinical Wound Specialists, is Assistant Chief Editor of their peer-reviewed journal, and is Scientific Co-Chair of the Desert Foot Medical/Surgical Conference. She recently kicked off a national campaign to increase the awareness of the importance of diabetic foot exams called, “Show Me Your Sole.” An activist for the American Diabetes Association, and the Save a Leg, Save a Life Foundation, Cynthia’s passion is to provide advanced skin care and prevention of wounds for those living with diabetes, and with her extensive knowledge of diabetic foot care, she is often sought out to lecture and publish globally. She has published close to 400 peer-reviewed articles, research, scholarly chapters and edited one book. “Diabetic foot care issues plague more than 11 percent of Missourians, along with many of my patients,” Cynthia added, “I am delighted to represent the great State of Missouri & City of Chesterfield while raising awareness for diabetic foot care & amputation prevention.” Mayor of Chesterfield, Bob Nation proclaimed 16 May “Cynthia Fleck Day” in the City of Chesterfield to honor the resident.